The Enhanced Vocational Inclusion Programme (EVIP) is a unique programme that offers vulnerable young people an alternative to mainstream secondary school education. It is a ‘virtual’ school designed to provide a vocational and employment focused learning experience for those who require intensive support and ongoing coaching. The unique EVIP programme has been nominated for the Education category at the Inspiring City Awards, which recognise a pioneering achievement by an individual or institution that has made an impact on the learning and development of Glasgow citizens at all levels. For the full story visit our News Page. Nominated for the second year running in the Inspiring City Awards for a programme that supports vulnerable young people. The programme is a product of a partnership between Glasgow Clyde College, Glasgow Kelvin College and Glasgow City Council Education Department. EVIP’s aim is to provide an alternative college based experience for pupils entering 4th year at secondary school who are seriously at risk of disengaging with the school curriculum and could benefit from undertaking a college programme. Each year, approximately 100 young people are identified by schools and support services as a vulnerable young person or who fall into the following criteria: looked after (at home or accommodated), on the Child Protection Register, subject to Vulnerable Young Person procedures, young carers or young people experiencing severe additional support needs. The prestigious Inspiring City Awards, supported by The Herald and Glasgow Chamber of Commerce, recognise the new generation of citizens who are making a tremendous contribution to the cultural and economic climate of Glasgow. Both colleges are gratified at such a sound endorsement of their work in delivering learning innovation and support, creating opportunities in education through strong partnership working. The Awards ceremony will take place at the Marriot Hotel, Glasgow on 6th September 2018. Programme which targets school pupils gains recognition in global magazine. Glasgow Kelvin College’s unique Kit Car Programme has been featured recently in The Complete Kit Car magazine, the only global monthly magazine dedicated to the world of kit cars and a touchstone for news on test drives, builds, technical guidance, shows and events. 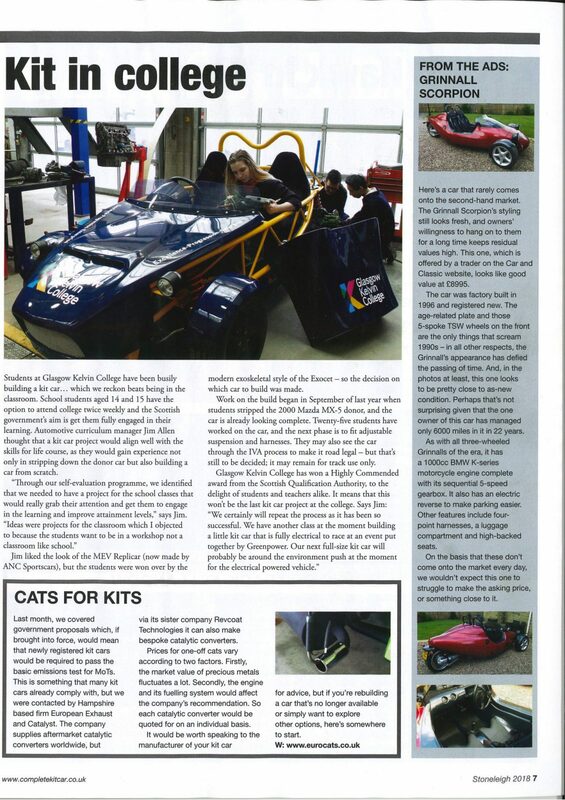 The article focuses on the College’s trailblazing programme which, now in its second year, provides 14 and 15yr old pupils from Glasgow Schools with practical, hands-on automotive mechanical engineering and build skills at SCQF level 4 in an industry-standard workshop environment. Run with the support of Glasgow City Council and in partnership with several Glasgow schools including Eastbank Academy, Whitehill Secondary, Springburn Secondary, Bannerman High School, St Mungo’s Academy, St Andrew’s Secondary, Smithycroft Secondary, All Saints Secondary, Lochend Community High School and St Roch’s Secondary to name but a few, the programme allows pupils to attend college two half-days per week where they gain skills in stripping down and building a kit car. In addition, they acquire employability and workplace skills which help them to build their confidence, solve problems and work as a team. The College’s full time and mainstream Vehicle and Body Paint students have also contributed to the project by working on the shiny and impressive bodywork for the sleek new car. The programme has already been recognised with an SQA Award and there are plans to continue and develop the content. Essential to the success of the project has been the College team behind the vision and the support of the individual schools involved. “Through the College self-evaluation process, we identified the need to have a project for schools which would really grab pupils’ attention, getting them to engage in their learning and improve attainment levels. The best way to achieve that would be in a workshop environment. Receiving the award was a great recognition of the work that has gone into design and delivery of the programme and the students and our team of tutors are delighted. 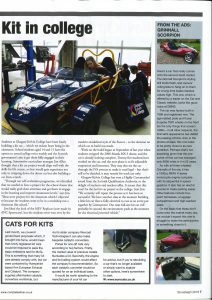 To see the programme featured in a publication like Complete Kit Car magazine is pretty special for us all. The students featured working on the Kit Car are Chloe Allan of St Paul’s High School, Andrew Early and Jason Aw of Bannerman High School. Students Gain Diversity Award for White Ribbon Campaign! Glasgow Kelvin College Student Association have once again been recognised for their hard work in delivering the White Ribbon Scotland Campaign. 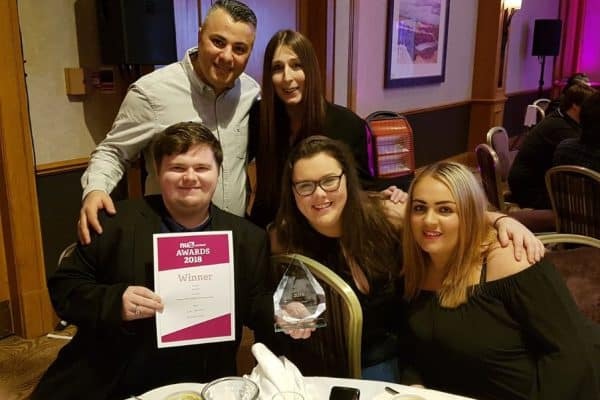 At the annual NUS Scotland Conference in Dunblane last week, the Student Association were delighted to carry off the top Award in the Diversity category in recognition of their excellent work supporting and developing the White Ribbon Campaign throughout the College and into the community. “It's allowed male students a voice in opposing violence against women. When we're not part of the debate then the fear is that people may think we accept it as a given. But that's not the case. I think many students have been relieved to be able to be part of this. And for others, it's been a bit of a learning curve, recognising the behaviours which are at the milder end of the continuum. We've had to approach it very sensitively. Our students can not only receive help but also offer that help to others in the wider community. We've still got a lot of work to do but we're determined to keep getting people signing up to the pledge. We’re delighted and honoured to have been recognised in this way. The College is delighted and very proud of the students’ achievement and looks forward to continuing its strong partnership with White Ribbon Scotland and supporting the students to get the message out there.